فلاحی, علیرضا, حافظی, محمدرضا, امیدخواه, عاطفه. (1397). تأثیر زمان تخلیه در برنامه‌ریزی مدیریت ایمنی آتش‌سوزی در دو ساختمان بلندمرتبه مسکونی. معماری و شهرسازی آرمان شهر, 11(25), 125-136. علیرضا فلاحی; محمدرضا حافظی; عاطفه امیدخواه. "تأثیر زمان تخلیه در برنامه‌ریزی مدیریت ایمنی آتش‌سوزی در دو ساختمان بلندمرتبه مسکونی". معماری و شهرسازی آرمان شهر, 11, 25, 1397, 125-136. فلاحی, علیرضا, حافظی, محمدرضا, امیدخواه, عاطفه. (1397). 'تأثیر زمان تخلیه در برنامه‌ریزی مدیریت ایمنی آتش‌سوزی در دو ساختمان بلندمرتبه مسکونی', معماری و شهرسازی آرمان شهر, 11(25), pp. 125-136. فلاحی, علیرضا, حافظی, محمدرضا, امیدخواه, عاطفه. تأثیر زمان تخلیه در برنامه‌ریزی مدیریت ایمنی آتش‌سوزی در دو ساختمان بلندمرتبه مسکونی. معماری و شهرسازی آرمان شهر, 1397; 11(25): 125-136. 1استاد گروه پژوهشی بازسازی، دانشکده معماری و شهرسازی، دانشگاه شهید بهشتی، تهران، ایران. 2دانشیار گروه ساختمان، دانشکده معماری و شهرسازی، دانشگاه شهید بهشتی، تهران، ایران. 3کارشناسی ارشد بازسازی پس از سانحه، دانشکده معماری و شهرسازی، دانشگاه شهید بهشتی، تهران، ایران. توجه ویژه به مقوله‌ ایمنی در برابر آتش‌سوزی در ساختمان‌های بلندمرتبه که تعداد زیادی جمعیت را در خود جای می‌دهند حائز اهمیت است. به‌دلیل چالش‌های منحصر به چنین ساختمان‌هایی، تأمین ایمنی این بناها نیازمند انجام برنامه‌ریزی و مدیریت ایمنی است. یکی از اصلی‌ترین موضوعات مورد توجه انجام تخلیه اضطراری ایمن و به‌موقع می‌باشد. 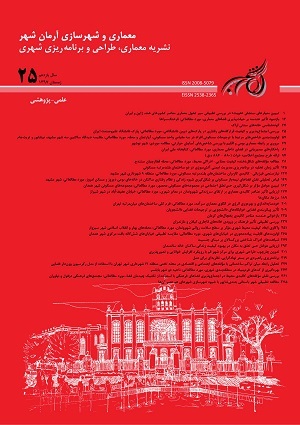 پژوهش حاضر، به معرفی مفهوم «زمان تخلیه» در قالب دو بازه «زمان تأخیر» و «زمان حرکت» پرداخته است. بدین‏منظور بازه زمانی تأخیر پیش از شروع حرکت به دو روش، و بازه زمانی حرکت به سه روش برای دو ساختمان بلندمرتبه مورد مطالعه محاسبه شده و مقدار بیشینه نتایج به‏دست آمده از هریک، انتخاب و با هم جمع شده و به ‏عنوان زمان کلی تخلیه درنظر گرفته شده است. سپس از طریق ترسیم خط ‏زمان برای هر ساختمان و مراجعه به مؤلفه‏های اثرگذار در روشی که زمان بیشینه را نتیجه داده‌اند، عوامل مؤثر در افزایش زمان تخلیه مورد تحلیل و بررسی قرار گرفته‌اند. نتایج تحقیق نشان می‌دهد به‏دلیل نبود ساختاری منسجم برای عهده‌دار شدن مسئولیت‌های مرتبط با ایمنی در ساختمان‌های بلند مسکونی، نگهداری نامناسب تجهیزات ایمنی، در هنگام رخداد آتش‏سوزی به‌علت تأخیر زمانی در شروع تخلیه ساکنان میزان زیادی از زمان موجود برای فرار را از دست خواهند داد و علاوه بر آن در هنگام خروج نیز با مسائلی چون حرکت کند جمعیت، مسدود شدن راه‏های خروج به‌دلیل کاهش عرض مفید و ورود دود و گازهای سمی به آن‌ها مواجه خواهند شد. نتیجه‏گیری نشان می‌دهد که تسریع فرآیند تخلیه اضطراری صرفاً به مفهوم حرکت سریع‌تر افراد در خروج نیست، بلکه با به حداقل رساندن زمان تأخیر پیش از تخلیه از طریق آموزش و مانور و انجام واکنشی سریع‌تر از طرف ساکنان و نیز کاربرد آسانسورها می‌توان ایمنی آتش را در تخلیه اضطراری افزایش داد. Averill, J.D., Mileti, D.S., Peacock, R.D., Kuligowski, E.D., Groner, N., Proulx, G., Reneke, P.A., & Nelson, H. E. (2005). Federal Building and Fire Safety Investigation of the World Trade Center Disaster Occupant Behavior, Egress, and Emergency Communications. National Institute of Standards and Technology (NIST NCSTAR 1-7), USA. Barber, D., & Van Merkestein, R. (2003). Will Occupants of Tall Buildings Obey Instructions from Wardens in Staged Evacuations? The Design Dilemma Post, CIB Report, 61-70. Barney, G. (2003). Vertical Transportation in Tall Buildings. Elevator World, 51(5), 66-75. Berkman, B. (2004). Developing a High-rise Residential Fire Safety Program, Leading Community Risk Reduction (An Applied Research Project Submitted to the National Fire Academy). NewYork City Fire Department: FDNY, USA. Brennan, P. (2000). Modelling Cue Recognition and Pre-evacuation Response. Fire Safety Science, 6, 1029-1040. Columbus Division of Fire. (2010). Safety Program and Emergency Procedures for High-rise/ High-risk Buildings. USA. Conca, A., & Vignolo, M.G. (2012). Pedestrian Flow Analysis in Emergency Evacuation. In of the Euro Working Group on Transportation International Scientific Conference, Paris. Europe, C.F.P.A. (2009). Fire Safety Engineering Concerning Evacuation from Buildings. European Guideline CFPA-E, 19, 4-46. Ferreira, M., & Cutonilli, J. (2008). Protecting the Stair Enclosure in Tall Buildings Impacted by Stack Effect. In CTBUH 8th World Congress “Tall and Green: Typology for a Sustainable Urban Future”, Dubai, UAE, 732-738. Galbreath, M. (1969). Time of Evacuation by Stairs in High Buildings. Fire Research, 8, Canada. Hakonen, H., Susi, T., & Siikonen, M.L. (2003). Evacuation Simulation of Tall Buildings. CIB REPORT, 219-226. Hurley, M.J., Gottuk, D.T., Hall Jr, J.R., Harada, K., Kuligowski, E.D., Puchovsky, M., Watts Jr, J.M., & Wieczorek, C.J. (Eds.). (2015). SFPE Handbook of Fire Protection Engineering. Springer. Kealy, M. (2008). Fire Engineering Super- tall: A New Approach to Escape. CTBUH 8th World Congress Proceedings, Dubai, 20-29. Kisko, T.M., Francis, R.L., & Nobel, C.R. (1998). Evacnet4 User’s Guide. University of Florida, 10. Ko, S.Y. (2003). Comparison of Evacuation Times Using Simulex and Evacuationz based on Trial Evacuations. Doctoral Dissertation, Department of Civil Engineering, University of Canterbury, Christchurch, New Zealand. Kobes, M., Post, J., Helsloot, I., & Vries, B. (2008). Fire Risk of High-rise Buildings based on Human Behavior in Fires. In Conference Proceedings FSHB, 07-19. Lay, S. (2007). Alternative Evacuation Design Solutions for High- rise Buildings. The Structural Design of Tall and Special Buildings, 16(4), 487-500. Liao, Y.J., Liao, G.X., & Lo, S.M. (2014). Influencing Factor Analysis of Ultra-tall Building Elevator Evacuation. Procedia Engineering, 71, 583-590. Mansor, N. (2012). Safety Management in High-rise Building; Case study: Petronas Twin Towers & Kuala Lumpur Tower. Doctoral Dissertation, Universiti Teknologi MARA. Mu, H.L., Wang, J.H., Mao, Z.L., Sun, J.H., Lo, S.M., & Wang, Q.S. (2013). Pre-evacuation Human Reactions in Fires: An Attribution Analysis Considering Psychological Process. Procedia Engineering, 52, 290-296. National Fire Protection Association. (2012). NFPA101 Life Safety Code Handbook, USA. Ng, C.M., & Chow, W.K. (2006). A Brief Review on the Time Line Concept in Evacuation. International Journal on Architectural Science, 7(1), 1-13. NIST. (2011). CFAST – Consolidated Model of Fire Growth and Smoke Transport Technical Reference Guide. Fire Research Division Engineering Laboratory, USA. O’Conner, D., Clawson, K., & Cui, E. (2012). Considerations and Challenges n Refuge Areas in Tall Buildings. In Proceedings of the 9-th International Conference on CTBUH, Shanghai, 77-81. Prashant, T. (2007). The Essential Aspect of Fire Safety Management in High-rise Buildings. Doctoral Dissertation, Universiti Teknologi Malaysia (UTM), Faculty of Civil. Proulx, G. (2001). Occupant Behavior and Evacuation. In Proceedings of the 9th International Fire Protection Symposium, 219-232. Proulx, G., & Fahy, R.F. (1997). The Time Delay to Start Evacuation: Review of Five Case Studies. Fire Safety Science, 5, 783-794. Purser, D.A., & Bensilum, M. (2001). Quantification of Behavior for Engineering Design Standards and Escape Time Calculations. Safety Science, 38(2), 157-182. Richardson, K. (2004). Fire Safety in High-rise Apartment Buildings. Canada Mortgage and Housing Corporation, Ontario Association of Architects, Canada. Ronchi, E., Gwynne, S., & Purser, D.A. (2011). The Impact of Default Settings on Evacuation Model Results: A Study of Visibility Conditions vs. Occupant Walking Speeds. In Advanced Research Workshop Evacuation and Human Behavior in Emergency Situations EVAC11, Santander, 81-95. Shen, T.S. (2003). Building Planning Evaluations for Emergency Evacuation. Doctoral Dissertation, Worcester Polytechnic Institute, USA. Tan, C.W., & Hiew, B.K. (2004). Effective Management of Fire Safety in a High-rise Building. Buletin Ingenieur, 204, 12-19. University of Greenwich. (2004). Introduction to BuildingEXODUS (BuildingEXODUS Software Guide Book). London.